Look what finally arrived in the mail today. Photographed next to the SDR-14, for size comparison. An early review of the Airspy HF+ is available in the December issue of "Radio User" (UK). From only a few days of use, Mike Richards noticed a "pretty amazing" strong signal performance on VHF (around 138 Mhz) and on HF (around 7 MHz). The key components makers were not named. Maybe we are at the beginning of a new generation of (almost) low cost and high performance SDRs ? I've been generally impressed so far. I have run into some images down on the LW band from SWBC stations, Youssef said they are still tweaking things (this can be done in software, via new DLLs). I have not run across any images on MW or HF. Here a nice comparison by Nils Schiffhauer (DK8OK), between the Elad FDM-S2 & the new AirSpyHF+ with 12 audio samples. All recording have been made on a 20 meter quadloop antenna. I am wondering if anyone has used the HF+ for QRSS or WSPR receive? 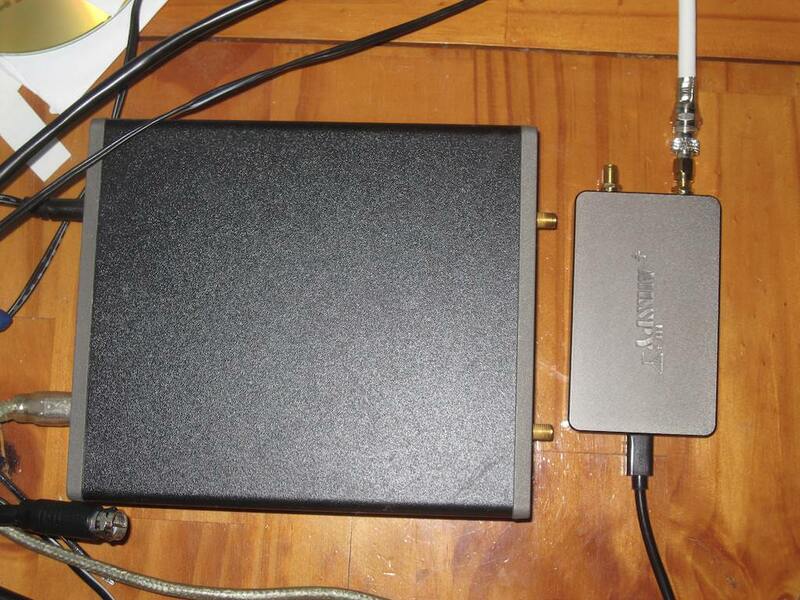 I use a cheap $22 RTL-SDR and it is very stable. I am sorry to say that I also have an Airspy Mini with a Spyverter and the Mini is not frequency stable enough, after a warmup, to use with these two modes. That to me is very discouraging. I am considering the HF+ but am somewhat concerned by what I found with the Mini which costs 4 times the price of the RTL-SDR. Any comments or experiences would be helpful. I've found the AirSpyHF+ to be extremely stable, frequency wise. I use it for SSTV decoding, as well as on the NDB band, and have not noticed any drift issues. As a test I just ran WSJT-X for a while on 40m and got lots of WSPR decodes, including many from Europe even though it won't be dark here in the Eastern USA for a few hours. Thank you Chris. May I ask what did you see on the drift column? That is where my Airspy Mini fails. Even after several hours I see drifts of up to +/- 4 but not consistently. I'll see a group of Zero decodes and the next decode I will see numerous stations with -4 drift. I check the stats page and no one else sees the driftdrift. On the other hand I can fire up my trusty SDR-RTL and rarely see any drifting of other station and when I do others verify it. Hey Chris, took the plunge today. Read your reviews that you have done throughout, and decided to order the Airspy HF+. I did like the frequency coverage of the SDRPlay a lot but for my use, I think this will be okay. I love HF no doubt, but the amateur radio side of me wants to start dabbling in the 2m range. I have a Kenwood TH- K2AT handheld and really haven't used it. I don't have anywhere near the setup you do as far as antennas, but I still think I will enjoy this a lot. I've been messing with computers since 1984 with my first Commodore 64 and 1541 floppy drive inputting homemade programs. Now I can integrate. Utilities I love also. Where is Airspy located in the U.S.? Do you know? I also bought my adapters from Amazon since they were cheaper. I'm kinda' psyched! !